Image Comics/Skybound Entertainment is pleased to announce that GASOLINA #1—by creators Sean Mackiewicz and Niko Walter with colorist Mat Lopes and letterer Rus Wooton—will be rushed back to print in order to keep up with customer demand. Fans of Robert Kirkman and Charlie Adlard’s THE WALKING DEAD in search of a new horror/adventure series to jump onto burned through GASOLINA #1. 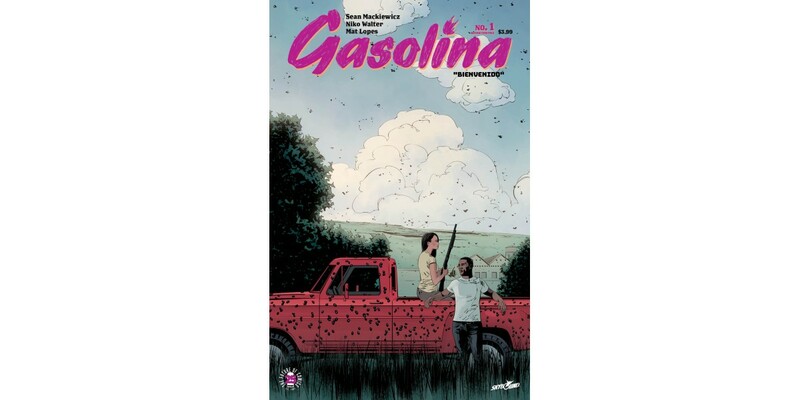 Set south of the border, GASOLINA #1 follows newlywed fugitives Amalia and Randy on their journey south from El Norte. They have played many roles in order to survive, but now, they must become unlikely leaders in the fight against a new cartel who uses inhuman tactics to ignite the most monstrous war Mexico—and the world—has ever seen. GASOLINA #1 will remain available for purchase across all digital platforms, including the Image Comics website (imagecomics.com), the official Image Comics iOS app, Comixology’s website (comixology.com), iOS, Android, and Google Play. GASOLINA #1, 2nd printing (Diamond Code AUG178485), GASOLINA #2 (Diamond Code AUG170651), GASOLINA #2 The Walking Dead tribute variant (Diamond Code AUG170652) will be available in stores on Wednesday, October 25th. The final order cutoff deadline is Monday, October 2nd.